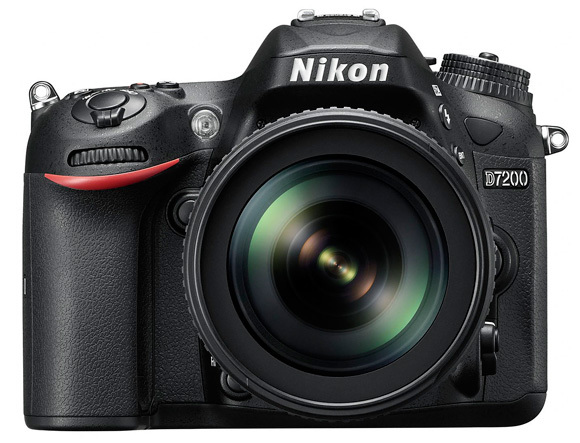 The new Nikon D7200 DSLR features a 24.2Mp DX-format sensor with no Optical Low Pass Filter, a weather-resistant shell, and improved autofocus and image buffer performance. The new Nikon D7200 DSLR will replace its predecessor, the D7100, as the new Nikon flagship DX-format DSLR featuring an APS-C sensor. Despite offering similar resolution — a minor change in the number of pixels, now 24.2Mp compared to 24.1Mp for the D7100 — Nikon has opted for a change of sensor in this updated model. Given the same 24.2Mp resolution without an Optical Low Pass Filter, it appears that Nikon has opted to build the D7200 around the Sony-made 24.2Mp CMOS sensor currently sitting in its DX-format D3300 and D5500 entry-level DSLRs. With an overall DxOMark Sensor Score of 82, the D3300 has previously ranked among the top ten for APS-C image sensors in the DxOMark Sensor Score database, which is encouraging for the new D7200, and we look forward to bringing you a full set of sensor scores and review as soon as possible. Despite featuring the same image sensor, the semi-pro D7200 DSLR offers enhanced build quality over entry-level models, thanks to its weather-resistant exterior that protects against dust and moisture. The LCD screen appears to be the same 3.2-inch model from the D7100, featuring a high-resolution 1229k-dot display with color-tuning controls to adjust the color balance and brightness. It is just a fixed-position LCD, which may be a bit of a disappointment to photographers or videographers after the flexibility that a vari-angle LCD offers. While it’s fair to say the D7200 offers only an incremental upgrade over the D7100, the improvements to both the autofocus and the image buffer should give the new Nikon D7200 a significant performance boost. For autofocus, the D7200 now utilizes the pro Nikon Multi-CAM 3500 II 51-point system in their FX-format full-frame cameras. All of the 51 autofocus targets offer sensitivity down to –3Ev, which is an extra stop of sensitivity compared to the –2Ev on the D7100, making for quicker and more accurate focusing in low-light conditions. What’s more, 15 of the autofocus targets located towards the center of the frame are the more accurate cross-type variety, and the center target offers sensitivity down to f/8. That makes the D7200 autofocus system compatible with all Nikon teleconverters, and switching the new Nikon D7200 into its 1.3x sensor crop mode ensures that the 51 autofocus targets cover the entire frame for edge-to-edge phase detection autofocus. Action photography enthusiasts wanting to crunch through lots of high-quality images will also be pleased that the size of the image buffer on the D7200 has been significantly increased. While the continuous shooting frame rates of 6fps in DX mode or 7fps in 1.3x crop mode remain the same, the D7200’s bigger buffer now holds up to 27 12-bit RAW images or 100 JPEG images, compared to a rather stingy 6 RAWs/50 JPEGs on the D7100. Nikon’s top-end EXPEED 4 image-processing engine has filtered down from their pro cameras too, and the D7200 is the first Nikon DSLR to feature both NFC and wi-fi compatibility for easier image sharing and distribution. NFC, or Near Field Communication, makes it possible to transfer an image displayed on the D7200’s LCD to another NFC-compatible device simply by touching the two devices together, and built-in wi-fi makes it possible to transfer a batch of images directly from the D7200. Download Nikon’s free Wireless Mobile Utility App, and then you can control and fire the D7200 wirelessly over a network, thanks to that built-in wi-fi. 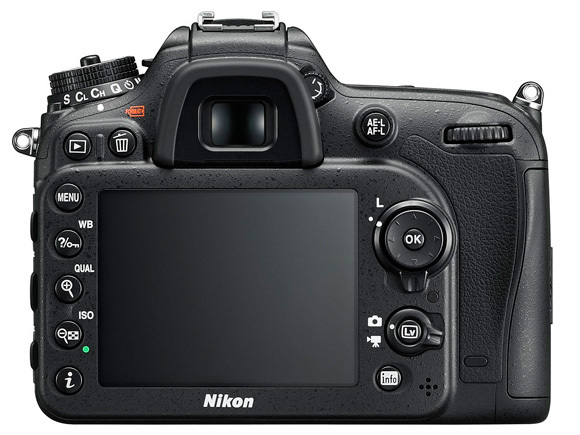 For video, the D7200 offers Full HD capture at 25p/30p, or 50p/60p when in 1.3x crop mode. The addition of Auto ISO control in Manual mode is designed to ensure smooth video exposures when changing between dark and light environments. There are enhanced sound-recording capabilities, too, with functions to select the audio range (such as wide or voice) and to minimize distracting wind noise. The D7200 is also compatible with Nikon’s new ME-W1 wireless microphone that can record sound up to 50m away from the camera. The new Nikon D7200 will be available from mid-March 2015 at a retail price of €1,199 (body only), or at €1,449 (including the 18-105mm VR kit lens). 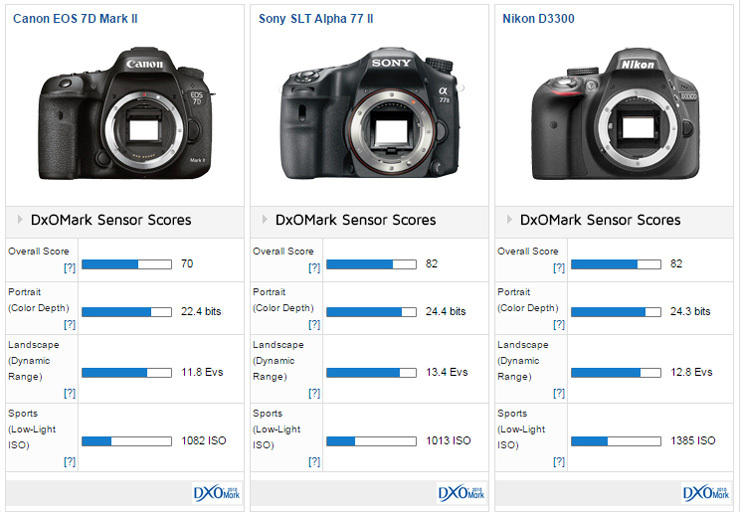 Occupying the top 3 spots for APS-C sensor image quality on the DxOMark database, and with 5 cameras in the top 10, recent Nikon DSLRs have been leading the way for APS-C image quality. The shift away from the D7100’s 24.1Mp APS-C sensor to what looks to be the same 24.2Mp model used on the D3300 is an interesting move, as both sensors have scored well in previous tests. With overall scores of 83 for the D7100 and 82 for the D3300, we can say that the overall image quality is almost the same, but the two sensors do have different strong points. Whereas the D7100 excelled for Dynamic Range, offering a one-stop improvement over the D3300 with a score of 13.7 EV compared to 12.8 EV, the D3300 offered marginally better low-light performance, with scores of 1386 ISO compared to 1256 ISO. How the new D7200 will stack up against these scores remains to be seen, but it would be surprising if it weren’t in the same ballpark. If so, then head-to-head with the competition from the Canon and Sony flagship APS-Cs, the new Nikon D7200 will hold up very well. The Nikon D3300 and Sony SLT Alpha 77 II boast an equal overall DxOMark Sensor Score of 82, with the Sony excelling in Dynamic Range and the Nikon offering slightly improved low-light ISO performance. 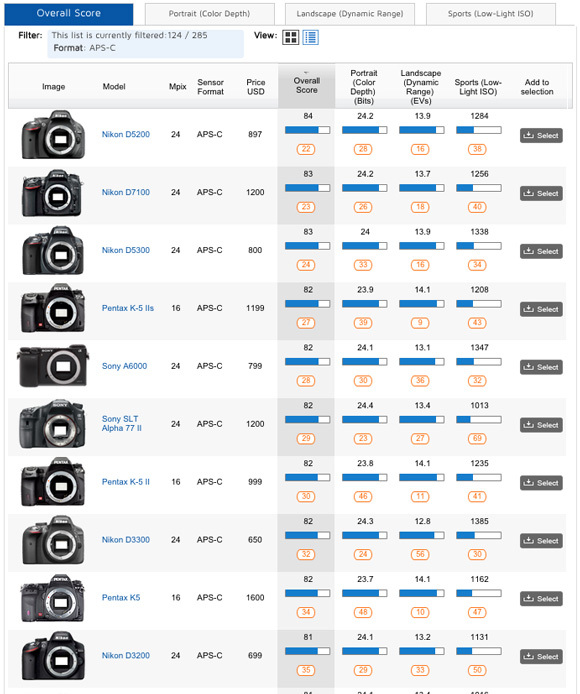 Both models offer around two-thirds of a stop better overall image quality compared to the recently-released Canon 7D MK II model, however, which ranks a little further down the database with a DxOMark Sensor Score of 70. With superior scores in all three sub-categories, the Nikon D3300 offers around one stop better Color Sensitivity and Dynamic Range compared to the Canon 7D MKII at base ISO sensitivity, and around one-third of a stop better low-light ISO. Look for a full test and review for Nikon’s new D7200 just as soon as we get our hands on it. 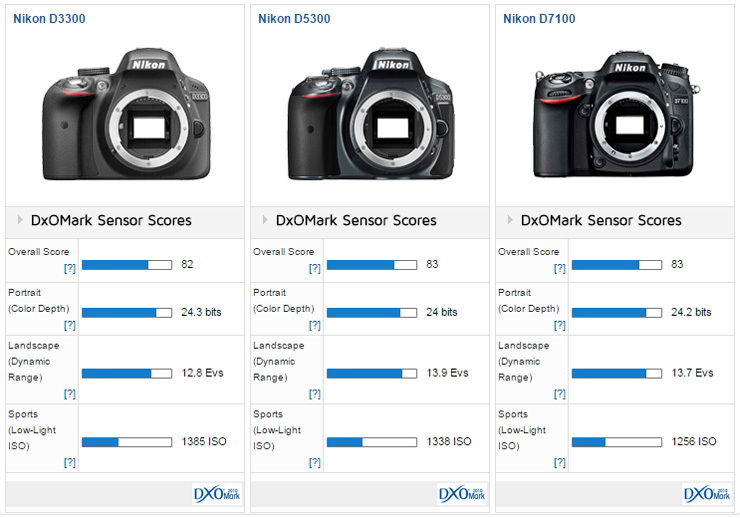 With cameras in all three podium positions, as well as 5 in the top 10, Nikon DSLRs are leading the way for APS-C sensor image quality on the DxOMark Sensor Scores database. Using the same 24.2Mp sensor from the D3300 may see a small boost in the D7200’s low-light ISO score at the expense of Dynamic Range, which isn’t as good as the current D7100. 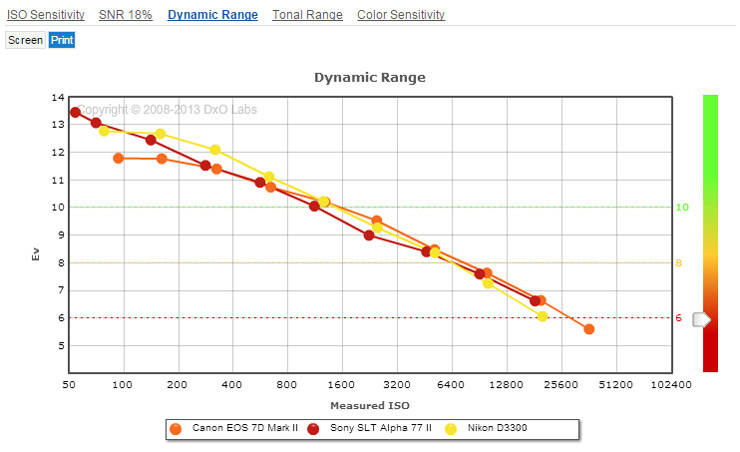 Nikon & Sony DxOMark Sensor Scores for APS-C DSLRs have the edge over Canon offering around 1 stop better Dynamic Range and Colour Sensitivity at base ISO sensitivity. 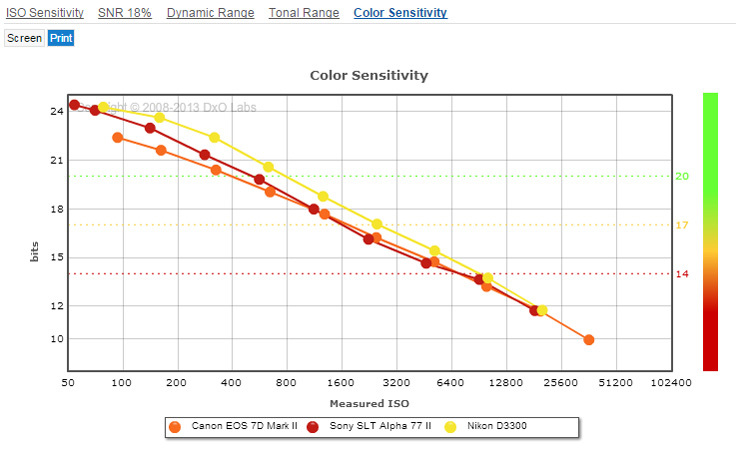 At lower ISO sensitivities the Sony SLT 77 II and Nikon D3300 offer improved Dynamic Range results compared to the Canon 7D MK II but the gap narrows at higher sensitivities. The pattern isn’t quite the same for Colour Sensitivity however where the Nikon D3300 offers better Colour Sensitivity compared to the 7D MK II at all ISO settings up to ISO 25,600.